With seven years of legal expertise, and a focus on criminal law, Elizabeth Bingham brings a high level of skillfulness to Rubin Thomlinson. Her expertise includes cases with challenging factors — such as potentially contradictory evidence, reluctant interviewees, and the implications of disability, mental health, and class. Elizabeth’s practical, methodical process and problem-solving nature have proven assets to her clients: allowing her to parse the facts reliably and responsibly, even in convoluted cases, while minimizing stress and slowdowns for all involved. She is also a strong listener, offering all parties a compassionate and considerate presence to share their stories. At Rubin Thomlinson, Elizabeth handles a portfolio of workplace investigations, including complaints of harassment, discrimination, and other forms of misconduct. She is also available to help organizations proactively identify and curb dysfunction, through workplace assessments and reviews. Finally, Elizabeth provides workplace investigation and human rights training to staff at all levels. 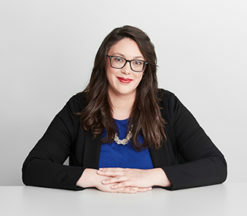 Before joining Rubin Thomlinson, Elizabeth served several law firms and institutions, with a focus on criminal defence. This high-stakes work included investigating complaints and allegations, conducting examinations and cross-examinations, representing clients in court and in review board hearings, and considerable research and reporting.